Soil nailing is an efficient, effective and economical method of soil reinforcement. The reinforcement is installed into the slope face of in-situ ground, whether natural soil or an existing fill, stabilising such material. 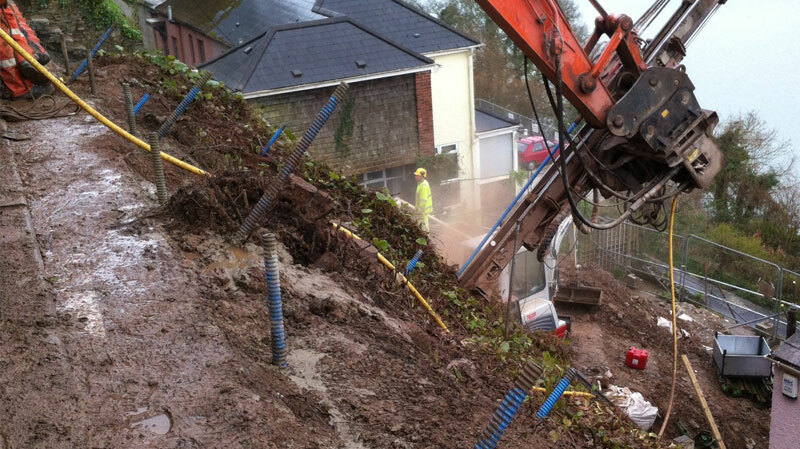 Soil nailing can be used to stabilise, existing structures such as unstable slopes, embankments and retaining walls. The use of soil nails can be adopted for the stabilisation of cuttings and coastal and quarried cliffs. The construction of new steep slopes for widening of infrastructure routes, new developments and new retaining walls, has seen an increase in the use of soil nailing. This method of soil reinforcement can be used for both permanent and temporary applications. This method of soil reinforcement can be used for both permanent and temporary applications and has been used by all the main UK infrastructure owners. The Ischebeck TITAN soil nail is a self drilling, case-less installation using the cement grout to stabilise the drill hole, during the installation. The TITAN system is therefore installed at a much faster production rate than that of a drilled and cased technique which is required for a solid bar soil nail. The Ischebeck TITAN soil nail system complies fully with EN 14490.